Tom Dudzick - Praise for "Don't Talk to the Actors"
Praise for "Don't Talk to the Actors"
"A love song to the theatre. Theatre's power to transform is fully, hilariously realized." It's drop-dead, scream-out-loud, tear-wrenchingly funny. Half of the play's uncommon hilarity comes from Dudzick's unquestionable talent for producing great comedic scenes. He has an ear for side-splitting dialogue that the best episode of "Will and Grace" would be hard-pressed to replicate. And for Dudzick's play, which spends three more wonderful weeks in Buffalo, one night will go by in a flash. If you are looking for great, unstoppable laughter, don’t miss the West Coast Premiere of the backstage comedy “Don’t Talk to the Actors.” This thoroughly entertaining and hilarious play is good old fashioned story-telling -- something rather hard to find in live theatre these days. A fresh, illustrative, literary narrative is a welcomed exception from what seems to be the general rule in live theatre today. Add a group of nicely played believable characters and the result is a play you don’t want to miss. “Don’t Talk to the Actors” captures backstage mayhem. Tom Dudzick’s comedy hits all the right notes at Laguna Playhouse. There’s something irresistible about a juicy backstage story. Michael Frayn found comic gold in the genre with “Noises Off” as did Woody Allen in his film “Bullets Over Broadway.” Tom Dudzick’s latest comedy is a worthy addition to the ranks. ...To anyone who’s worked in theatre, everything contributes to an eerie sense of déjà vu. This little slice of daily life -- terror, tedium, exhaustion, hatred and joy tethered to a single, short leash -- seems all too real. It’s hilarious only to those who have never lived through it. Don’t talk to -- but laugh at -- the actors. This play will tickle the socks off anyone who’s ever been in theatre on any level. It makes the most out of the playwright’s previous experiences in a similar situation and shares with the audience a glimpse into the inner workings of the theatre. The play tickles the funnybone while plucking the heart strings. Dudzick gets the theatrical season off to a happy start with a play that is solid and engaging. An old-fashioned kind of play...the opportunity to laugh and laugh is very enjoyable, indeed. 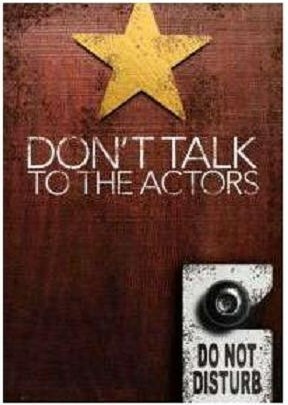 "Don't Talk to the Actors" is a pleasure. This play will appeal to only two types of people: audiences and actors. Patrons will revel in the intelligent joke-making and wry insights. Performers will play dirty tricks to win the juicy roles in this exaggerated demonstration of how the sausage of theatre is made. The Verdict: Guilty of hilarity in the first degree, and for taking its own advice. Don't talk to the actors, just give them a great script and let nature take its course.